But what a lot of "professionals" don't look to do is to take some time and put some time and energy into marketing for ideal clients. Clients who are looking for their services and professionalism to help them out with their investments and retirement. That's what I love about working with IRA and Self Directed IRA clients. Not only have they taken action to start the process of securing their retirement and future, but they often have the necessary funds to put their plan into action. And those types of potential clients are gold for real estate and financial professionals. 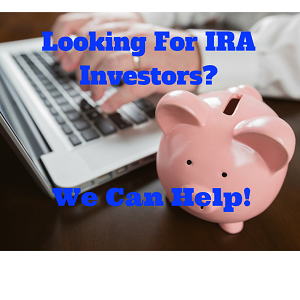 What's different about people with IRA's? Well they've taken the first step to start saving. They are in the top 15% of people out there who are actually saving and doing things. When you figure that 87% of households are one missed paycheck from being in default, then you really start to treasure working with individuals and households who have started to put their proverbial financial ducks in a row. There are over 42 million IRA owners out there, and yes while a large percentage of these are small accounts with less than $25,000 balances, that's still quite a chunk to invest or put a down payment down on an investment property! But unfortunately, most professionals are chasing the "whales" with million plus balances who already have paid counsel to help them with their transaction. The largest undeserved population is the 29 million households that have a net worth of $100,000 plus. That's a lot of people who are motivated, educated, and ready and willing to pull the trigger on an investment to help finance their kids college education, their retirement, or to put their investments into overdrive. It doesn't take much to track these individuals down. You could jump online via the county records and pull list of properties owned by self directed IRA owners or loans made from the same crop of potential clients. I did a recent webinar on that topic here. But that takes time and dedication to research those leads on a regular basis. You then have to put your marketing efforts into effect with letters, postcards and other direct mail that will usually yield you a 1-4% response rate. That's still not better then door knocking or networking! When you add in that each mail piece can run you $2 for printing, posting, and materials, it doesn't take long to run up a bill. In today's age, we have to value our time to be more efficient then the crowd. That's why when you cross market with direct mail, phone calls, and emails, you can effectively shoot your response rate up to 20%+ (which is the normal open rate for email). That's a 500% ROI above and beyond direct mail or postcards that most realtors and mortgage brokers waste their hard earned commissions on. So what would a qualified investor lead be worth to you? Would you say at least the cost of what it would take you to mail out to them? What would it be worth to you with a working phone number and email address? Taking a few minutes to communicate with your lead via email along with a follow up letter or phone call can not only increase response rate, it can also fill up your appointment calendar with potential quality clients who are ready to write a check or invest with you.